here are the slides, the code to produce them, and the general syntax of today’s session. here is the presentation for this week and here is a commented R script. here is the presentation for this week and here is a heavily commented R script. and the panel positively commented on the importance of the work she is proposing. Watch this space for innovative work on place attachment! the 3rd R session is over. Have a look at the slides and the solution code if you want. New Zealand is exposed to many natural hazards, including earthquakes, tsunamis, volcanic eruptions, and flooding. Preparedness for these hazards is crucial to ensuring individual and community resilience in the face of environmental threats. I propose that place attachment (a person’s bond to their meaningful places) plays an important role in personal preparedness for a range of hazards. I will firstly test the relationship between place attachment and existing disaster preparedness in two surveys distributed to Wellington residents (Study 1 and 2). These surveys will also serve to factor out place attachment across various dimensions (e.g., social and physical) and spatial targets (e.g. house, neighbourhood, city, and country). I intend to then experimentally manipulate place attachment in Study 3 to test its outcome on behavioural intentions to prepare. 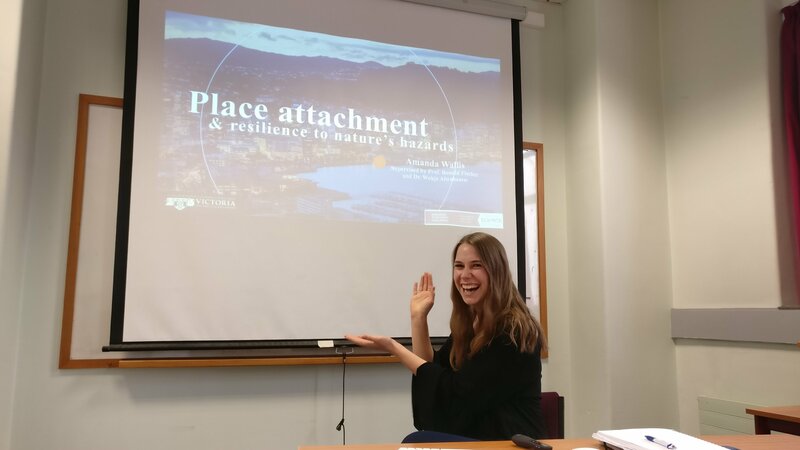 Finally, using findings obtained in Studies 1-3, a place attachment intervention will likely be trialed with a community sample in the Wellington region with the goal of enhancing actual disaster preparedness behaviours (Study 4).